To eat your way around the world you do not have to spend thousands of pounds going on a world cruise. Most of your eating will be the ship food, as good as it is that will not have the variety of eating in the countries you visit. Instead you can spend your thousands of pounds, less if you like, eating in the variety if restaurants in Huddersfield town centre. The list tat follows is from memory, my apologies to those I have missed. You could eat Chinese, Japanese or Thai. There is Mongolian too, but that is outside the town centre. You can eat South Asian, not just the generic Indian restaurant food, but specific cuisines such as Bangladeshi and Kashmiri. There is Lebanese and Turkish and the latest to open, Syrian. There is not much in the way of African food, though we do have a Mediterranean restaurant that serves North African dishes, and the Nandos chain of Portuguese Piri-piri chicken was started in South Africa, so I don’t know if that counts as African or European. Speaking of European, there is a choice of Spanish and Italian restaurants. Although there are no places serving East European food there are small supermarkets dedicated to their produce, German, Spanish, French, Czech and Polish beers can be bought in a number of places. From across the Atlantic we have a Brazilian restaurant, in premises that previously served Argentinian, a Caribbean restaurant and the usual burger and chicken fast food chains from the USA. 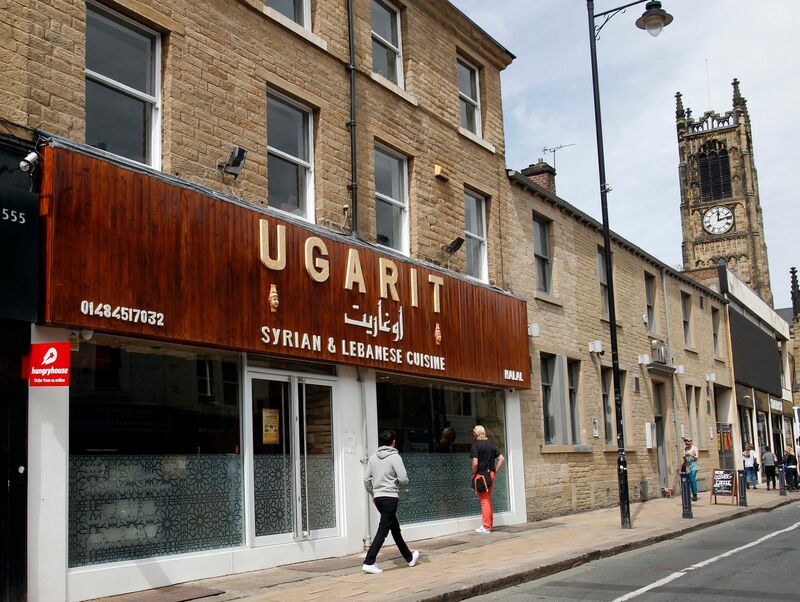 All this great variety of food is because Huddersfield has for centuries been welcoming to immigrants, particularly to refugees, Syrians being the latest in a long history. The first were the French Huguenots in the 17th century, fleeing the persecution of Louis XIV, the Sun King. In the industrial age migration within Britain became large, migrants coming from Lincolnshire, East Anglia, Scotland and Ireland. Irish immigration continued after the 1840 famines. The development of the chemical industry brought Germans and Italians, then during the First World War a number of Belgian refugees settled here, followed by Basques during the Spanish civil war. After the second world war Polish, Latvian, Estonian, Lithuanian and Ukrainians settled here along with German and Italian prisoners of war who chose not to return to their homelands. 1948 saw the first wave of migrants from the Caribbean on the SS Empire Windrush, and in the late 1950s and early 1970s migrants from Pakistan and India came to work in the textile industry; their women followed in the 1970s. These have been added to due to the arrival of Kenyan and Ugandan Asians seeking asylum. May 2004 saw an influx from Eastern Europe following several countries joining the EU, a number of Kurds, mostly refugees settled at the same time. All this immigration has enriched our society in lots or ways, not just our palates, and has made Huddersfield the vibrant multicultural place it it today. There is an initiative to welcome strangers. On the day that US President Donald Trump visits the UK people are being asked to welcome those from other countries and cultures and show that we disapprove of policies such as Mr Trump’s to be unwelcoming to those from other lands. If you do not know any recent migrants, go to one of their restaurants and welcome them there.